In vertebrate eyes, the nerve fibers route before the retina, blocking some light and creating a blind spot where the fibers pass through the retina and out of the eye. In octopus eyes, the nerve fibers route behind the retina, and do not block light or disrupt the retina. In the example, 4 denotes the vertebrate blind spot, which is notably absent in the octopus eye. In both images, 1 denotes the retina and 2 the nerve fibers, including the optic nerve (3). 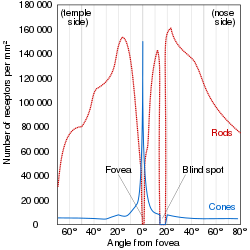 A blind spot, scotoma, is an obscuration of the visual field. A particular blind spot known as the physiological blind spot, "blind point", or punctum caecum in medical literature, is the place in the visual field that corresponds to the lack of light-detecting photoreceptor cells on the optic disc of the retina where the optic nerve passes through the optic disc. Because there are no cells to detect light on the optic disc, the corresponding part of the field of vision is invisible. Some process in our brains interpolates the blind spot based on surrounding detail and information from the other eye, so we do not normally perceive the blind spot. The blind spot is located about 12–15° temporally and 1.5° below the horizontal and is roughly 7.5° high and 5.5° wide. Instructions: Close one eye and focus the other on the appropriate letter (R for right or L for left). Place your eye a distance from the screen approximately equal to 3× the distance between the R and the L. Move your eye towards or away from the screen until you notice the other letter disappear. For example, close your right eye, look at the "L" with your left eye, and the "R" will disappear. ^ Brian A. Wandell (1 January 1995). Foundations of Vision. Sinauer Associates. ISBN 978-0-87893-853-7. ^ Gregory, R., & Cavanagh, P. (2011). "The Blind Spot". Scholarpedia. Retrieved on 2011-05-21.